To explore how prayers were used as expressions of spirituality among community-dwelling African Americans in response to life-threatening illness. Fifty-eight older African American adults residing in the Southeastern US participated in a qualitative descriptive study. Through prayers, participants requested the strength to endure, protection, healing and expressed gratitude. Prayers were expressions of spirituality through dimensions of connectedness: transpersonally to God or the unseen; intrapersonally to one’s inner-self; and, interpersonally to others. Prayers are an important aspect of spirituality and the mental health of older African Americans particularly during serious, life-threatening illness. 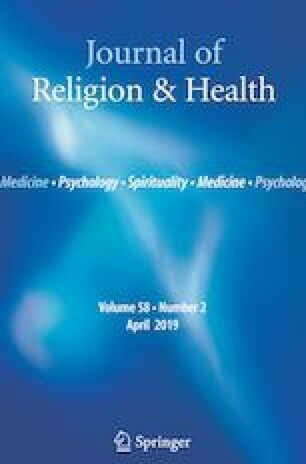 An understanding of the ways in which prayers are used might enhance the cultural relevance of mental health interventions in this population. The authors would like to acknowledge the participants who openly shared their use of prayers in response to a stressful life event. A special thank you to those individuals who helped with recruitment and interpretation of findings—Deacon William Marvin Hamilton, Rev. Herbert Grant, Rev. Dr. Marcus V. Ingram, Sr., Rev. Chester Spruill, Rev. William E. Daye, Rev. Bobby Hill, Deacon Bobby Stafford, and Ms. Priscilla Lewis and Ms. Valerie Worthy of Sisters Network, Inc.
CDC. (2010). Racial and ethnic populations. Retrieved from http://www.cdc.gov/omhd/Populations/populations.htm.